HA! Got ya! It’s april fools day! I hope you like today’s comic. I spent all of march coming up with it. HA! April fools. I bet you noticed a lot of Webcomics out there with similar jokes yesterday. Well it was all a big joke that Peter of Rock Paper Cynic and I had. With the help of Alex Norris (Who created the comic script we all copied) and a group of webcomic buds we wanted everybody to post the same joke, with the same composition and then get angry on social media that everybody copied their comic. It went so well that even comics and people that weren’t “in” on the initial joke jumped on board. It was crazy. All the awesome directions this whole thing took. There’s too many out there to know and find but here’s a list someone on reddit has been compiling. Thanks for sharing in the goofs! Really? I can’t tell, cause I saw one posted before you posted yours. Ahaha jesus I can’t wait to see the final count on how many comics joined this joke. I’m up to 4. That imgur link links to a different one. sheet. I guess I’m pranked. Idk if this is some Meta joke going around between you webcomic artists. But OwlTurdComix (OwlTurd.com) also used this joke. I am assuming, due to sheer abundance, that this might be an in joke. 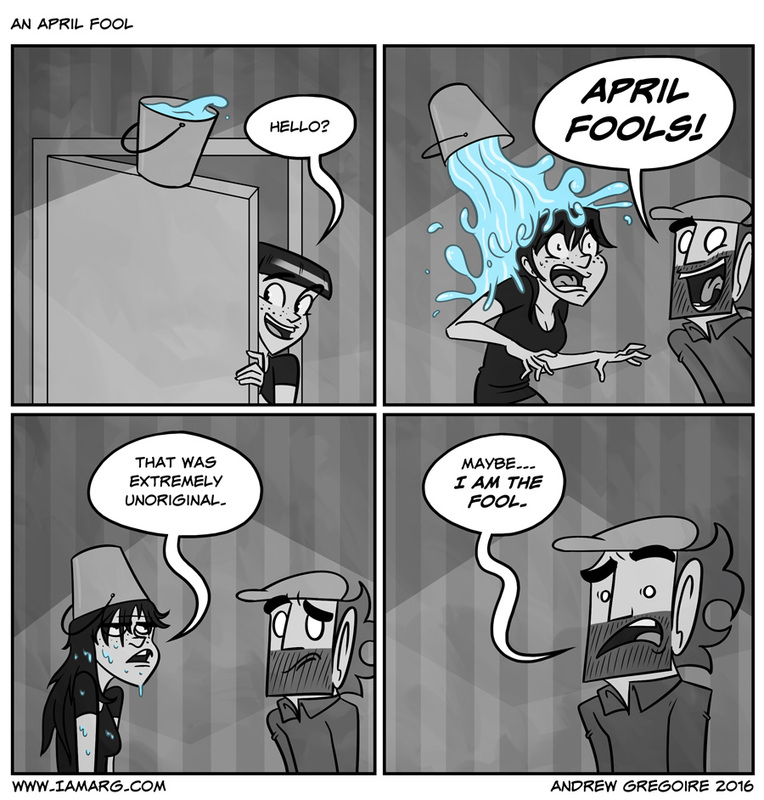 This is some crazy April Fools Day webcomic shiznit goin on today. Wow, sooooo many webcomics jumping on this bandwagon. Are you coming to the calgary expo this year? He still plans to go to the 2014 one, based on the latest front-page update. OH NO! Andrew’s dead….again! I always know he’s died when nothing new shows up. I am bereaved (for real, if he’s actually dead). Dang it…Bowie…Prince…Andrew. Maybe…we are all the fools. Killed by the wife for dumping a bucket of cold water on her head? Has Andrew been in an accident or something? Last Facebook post is May 1st…. That’s the most recent anything I can find from him. His last tweet was 15 hours ago, so he’s still alive! No comics for us until Overwatch becomes boring. It’s almost July… Where are you, Andrew? The world needs you. Remember when this webcomic updated? Pepperidge Farms remembers. Kind of. Its memory is actually getting a bit hazy. That LEGO injury must have been worse than anyone imagined. Why does Andrew hate us? Why does Andrew hate the world? It’s obvious he does, for why else would he abandon us so in our hour of need? so I binge-read the whole thing only to find out that there hasn’t been a new comic for over three months? what am I supposed to do now? Well, That’s it for me. I’m done checking this one. It’s a bummer, but, hey, Real Life happens. Time to move this one to the X-comic / might be dead, menu. I still miss calamities of nature. Is this gonna be a massive meta-joke by having the next update on April 1st, 2017? Knowing him he will post it at midnight and then nothing until the domain gets repossessed. I’m here for the memorial service. Maybe… WE are the fools. Damnit, Andy! Why you gotta make fools outta your fans? Why have you forsaken us? 2+ years since the last update. Every time I check, it’s the same bucket falling. I feel that there is some measure of humor in the comic ending on April Fools’ day. I still get a kick out of the archives. I look forward to any work from Arg, whatever he decides to do. I am sorry we contributed to your pain. You owe us nothing but continued health.